PETALING JAYA: Despite the overall gloom and doom in the global economy, a glut of condominiums and cooling measures by Bank Negara to deter speculation in the overall property market, the general observations on the ground indicate strong sales for certain segments of this market. This underscores the fact that real estate continues to be a preferred investment choice in the current economic climate. 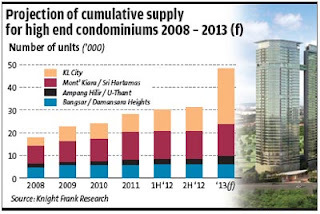 The latest report by Knight Frank Real estate highlights 1st half 2012 said there were five completions in the first six months of this year, bringing the total cumulative supply in Kuala Lumpur to 29,882 units. Another five developments are expected to be completed in the second half this year. This will bring the cumulative supply to 31,163 units. 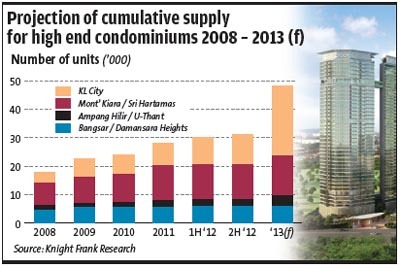 These numbers cover the high-end condominium market priced RM500 per sq ft and above. These new completions, coupled with existing supply and weak occupancy rates, are expected to put further pressure on the rental market. The report also noted that smaller sized apartments and SoHo units were becoming a mainstay in the Kuala Lumpur condominium scene and the dual-key concept was steadily gaining acceptance and popularity among developers and purchasers. These two over-riding trends in the high-rise residential sub-segment help add product diversity, it said. Dual-key units comprise a studio apartment unit attached to an otherwise standard condominium unit. Such units come with two separate doors with one leading to the studio unit, and the other to the adjoining unit, bonded with a common foyer. While there were multiple SoHo developments being launched, three dual-key concept residences entered the market and all three recorded good take-up rates, the report said. The recent increase in the number of new launches offering smaller units in established locations and popular suburbs is driven by the scarcity of land and high land costs, as well as pressure for developers to keep end-pricing affordable. Although the units are small, on a per sq ft basis, the price will be higher than the larger units. As for pricing, in the primary market as when buyers buy directly from the developers, the high-end condominium sector saw a slight drop in average asking prices in the city while the fringe and suburban areas generally demonstrated a stable trend. Similarly, there was a notable decline in transacted prices in the city's secondary market where buyers buy directly from owners instead of from developers. Projects located on the fringes of the city, however, saw more sales and leasing activities. “The outlook is, however, more cautious as sentiment is clouded by both internal and external issues, including those of a political nature,” the DTZ report said, adding that the market was expected to experience a period of slower growth going forward. In the office segment market, the market was relatively stable despite a spike in new supply. Menara Felda will be the new corporate headquarters of Felda Land Development Authority which has just listed Felda Global Ventures Holdings in one the of biggest initial public offerings internationally for the year. Menara Darusalam, a mixed development, will house the new Grand Hyatt Hotel. With several recently completed office buildings in the vicinity such as Menara Worldwide and Menara Prestige still filling up spaces, the new additions will add pressure on rents, DTZ report said. Prime office rental rates remain stable and resilient at the moment, averaging RM6.23 per sq ft per month, while top tier offices are commanding about RM7.90 per sq ft per month, the report said. “With a substantial pipeline of supply completing in the second half of this year and next year, rents are forecast to fall,” the report said. Knight Frank said the cumulative supply of office space in the city stood at 47 million sq ft and will increase to 48.6 million sq ft with the completion of three new offices by the end of this year. The supply in the city fringes today stands at about 17.5 million sq ft. Some 4.1 million sq ft will be added to the fringes by the end of next year. IPOH: The Haven, the luxury lakeside residence in Tambun, Ipoh is set for completion by the middle of next year, said The Haven Sdn Bhd chief executive officer Peter Chan. He said the group was the first developer to conduct a “topping-out” event for the three towers simultaneously, and construction of the project was ahead of schedule. “The project has surprised many people with its speedy sales and construction by topping out all three towers concurrently,” he said at a dinner to mark the topping-out ceremony on Saturday. The Haven is Perak’s largest and tallest residential condominiums. Chan said that out of the 500 units, over 75% has been sold while another 100 units were still available with each unit costing between RM600,000 and RM3.8mil. The Haven would be managed by international hospitality chain – Best Western which would market and lease out the apartments on behalf of owners. At an average price of RM600 per sq ft, The Haven is located near Sunway Group’s Lost World of Tambun water theme park and the Banjaran Hotsprings Retreat in Tambun. IPOH: The real estate sector in Perak is undergoing rapid development especially in Parit Buntar and Bagan Serai as demand for housing was mounting, says Mentri Besar Datuk Seri Dr Zambry Abdul Kadir. “I would like to inform that land application in Parit Buntar has been exhausted, which means there is no more government land left for development following the high-level of development taking place,” he said, adding that the state government would ensure there was enough demand in every development to avoid any over-supply situation. “Ipoh is not about old abandoned buildings. We have many new projects,” he said after officiating at the topping up ceremony for a RM270mil luxurious condominium project in Tambun.